Reporters attending Parks Canada’s Sable Island announcement this morning at the Halifax Citadel were apparently in stenography mode. Or perhaps they had been instructed to fish for soundbites on more urgent stories, like the confusion around environmental and salvage measures for the grounded bulk carrier MV Miner. ”Sable Island would be well-protected, and it would be an area that we would encourage visitors to come to and they would be well taken care of while they’re there,” he said after a news conference at Citadel Hill in Halifax. “[H]onestly, that’s the first I’ve heard of it,” a reporter confessed. “Why have you chosen this windmill to tilt,” another asked. “Tilting at windmills,” of course, is a figure of speech derived from Miguel de Cervantes’s novel Don Quixote, in which Quixote jousts with windmills he imagines to be giants. I assume the reporter used it metaphorically to imply I am attacking imaginary enemies, or fighting futile battles. The enemy is not imaginary, nor is the battle futile. Moreover, the issue is too important for reporters to arrive at a news conference ill-prepared. It’s important because Sable is one of the province’s premiere natural landscapes, a category that has steadily dwindled (most recently with the province’s egregious failure to buy Pollet’s Cove when it had the chance). Sable has many remarkable features, including terrain, vegetation, wildlife, and habitat, and a unique location. It is the only island lying roughly 100 miles off the east coast of North America, a vantage offering significant opportunities for scientific research on air quality. Most people with deep knowledge of Sable recoil at the idea of encouraging private sector tourism promotion because of the damage unrestricted visitation would cause. But people are people, and when they see a gorgeous landscape, the impulse to develop it is hard to resist. The need for constant vigilance in protecting natural treasures is what gave rise to the national park systems in the US and Canada. Sable is unique in that creating the usual park infrastructure and encouraging normal park tourism would be highly destructive of its many fragile natural elements. I would have preferred a custom-made solution for Sable rather than a National Park. People who take the opposite view worry that a one-off solution would always be vulnerable to change or abandonment in a way that a National Park will not be. I hope they are right. Some people with very deep commitment to Sable — specifically Sable resident Zoe Lucas of the Green Horse society, and Mark Butler of the Ecology Action Centre — hold that view, and I have to concede they may be right. Still, Prentice’s comments were so reckless and disturbing, they need to be challenged throughout the process. There was no public consultation before this park decision was made. All consultation came after bureaucrats, meeting privately, chose a park over a national wildlife refuge. That made the post-decision public consultation look like window dressing, but hundreds of Sable lovers weighed in anyway, and they overwhelmingly opposed accelerated tourism development. The hapless bureaucrat who had to report the results of these consultations at a public meeting said the message had come through loud and clear. I hope it will be enough. But with pro-development ideologues running the country, one never knows. The balanced discussion of the tourism issue on Zoe Lucas’s Green Horse Society website, the definitive source for information about Sable. The Hands Off Sable Island Facebook page I started to protest Prentice’s reckless speculation. Previous Contrarian posts on the issue here, here, here, and here. Park’s Canada’s FAQ page for Sable’s designation as a national park, which includes various tips for would-be Sable tourists. 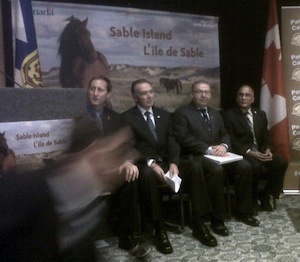 The federal-provincial MOU that kicked off Sable’s process leading to Sable’s designation as a national park. The official Visitors’ Guide to Sable Island by the Canadian Coast Guard, which currently controls access to the island. The report [pdf] of Ottawa’s after-the-fact public “consultation” about Sable’s park designation, in which officials were innundated with pleas to restrict tourism. The Nova Scotia Museum’s extensive Sable Island website. The Maritime Museum of the Atlantic’s Sable Island website. The Coast’s coverage of the Sable Park tourism brouhaha. Nature Canada’s comments on the Sable Park tourism brouhaha. Incredibly, officials did not release the federal-provincial agreement signed yesterday, but promise to do so soon, at which point I will link to it. The original Herald article sparking the issue is no longer archived on line. A final notes: There is a rational case to be made for limited Sable tourism. Zoe Lucas and others make it eloquently on the Green Horse Society page devoted to the national park designation. [L]imited tourism has not had a negative impact on the island, and some people feel it has been a positive force. Individuals who have seen Sable first-hand have been able to share with others their enhanced appreciation of the island as well as their understanding of the critical role of the Station. Many have subsequently supported efforts to ensure that year-round environmental stewardship for Sable Island is maintained. I agree with this, but Prentice was not proposing “limted tourism.” Plenty of people would leap at the chance to open up the island to commercial exploitation. Sable’s fervent cadre of supporters need to guard against that. And senior Halifax reporters need to do their jobs.